An officer escorts five men from the Alexandria (Va.) Library in August 1939. They were arrested and charged with disorderly conduct. Say “civil rights sit-in,” and the mind automatically flashes to the famous peaceful protests that took place in 1960 at a Woolworth’s lunch counter in Greensboro, North Carolina. But many other antisegregation demonstrations happened before and after those protests, and many were in libraries. January 9, 1962. Several black teenagers enter the Carnegie Library in Albany, Georgia, and are refused library cards. The same thing happens the next day. Later that year, the city closes the library rather than allow it to be integrated. September 15, 1963. In Anniston, Alabama, two African-American pastors, Nimrod Quintus Reynolds and Bob McClain, ask for library cards at the town’s Carnegie Library. They are viciously beaten by a white mob but manage to escape. 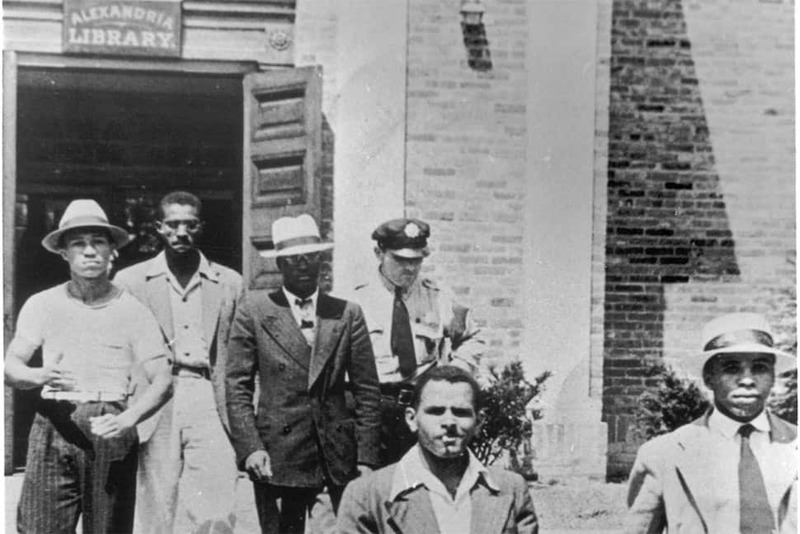 The next day, members of the library board accompany McClain and another black minister, George Smitherman (Reynolds was recovering from his injuries), as they go to the library and apply for library cards, this time successfully.